Tom Cull is the creator and Head Chef of Dartmoor Kitchen and the Tom’s Pies range of gourmet pies.Tom possesses a raw talent that has originated from a background of home cooking and beautiful food sourced on his own Dartmoor doorstep.He was raised in a cooking environment and has been inspired and guided by food from an early age. After much travelling and gaining valuable experience cooking in prestigious kitchens, Tom returned to Devon with a keen plan to create a truly gourmet pie. He converted an old barn into a kitchen on his family’s 40 acre organic farm near Chagford in the heart of Dartmoor and started growing vegetables and making pies. Initially he supplied small delis, cafes and grocers locally before demand and production outgrew the barn and a bigger site was needed! Tom’s Pies ethos comes from Tom’s firm belief in using responsibly sourced British ingredients, local where possible, and this is reflected in his insistence on sourcing only the best produce for all his food production. Tom’s Pies are all handmade from scratch in small batches by skilled chefs, the unique and delicious fillings are wrapped in the trademark thin and buttery short crust pastry. Tom’s Pies are now supplied nationally through a range of high-end independent retailers such as Harrods, Fortnum & Mason, Selfridges, Partridges, Daylesford, Rick Stein’s Deli and River Cottage as well as Booths and Ocado whilst still maintaining relationships with many small independent delis and farm shops that have supported the brand from the start. On the food service side of the business they supply a range of pubs, hotels and restaurants such as Wembley Stadium, Eden Project, John Lewis, Geronimo Inns, Accor Group, DeVere Hotels, BA, The King Alfred and many more. 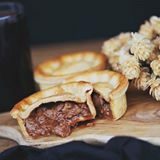 Tom’s Pies continue to win multiple awards, in 2014 Tom’s Pies won Great Taste Awards, Gold British Pie and Taste of the West awards as well as overall category winner for Savoury Bakery in the Taste of the West Awards. 2015’s awards included three Taste of the West Golds and three Great Taste Awards of one and two gold stars.